Stainless steel case. Silver-tone stainless steel bracelet features a double-press deployant closure. Round face. Three-hand analog display with quartz movement. 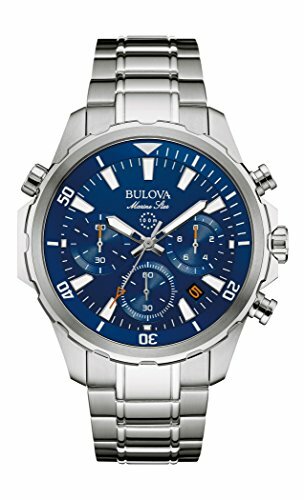 Blue dial features silver-tone hands and hour markers, three subdials, minute track, date display window, and Bulova detailing. Chronograph functionality. Water resistant 100m. Imported. Designed with a soft black silicone band called Dura Soft, an oversized stainless steel bezel and Earth-inspired colors, the PRG600Y-1 looks great with casual wear and feels comfortable on the wrist. In addition, it features three-dimensional index marks and broad hour and minute hands for optimum visibility, with large numerals at the 12, 3, and 9 o clock positions. 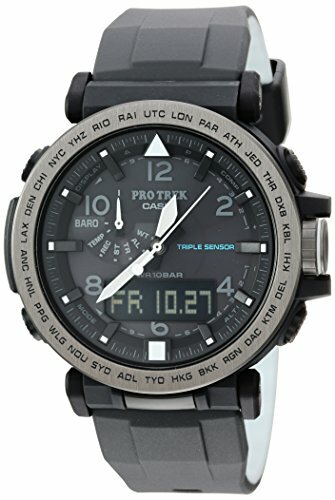 Other features include 29-city world time + UTC, five daily alarms, full auto double LED lights with afterglow and more! Dive Deeper Into Life with this Seiko Prospex Automatic Diver. The SRPC07 offers professional specifications for those with a strong sense of adventure. 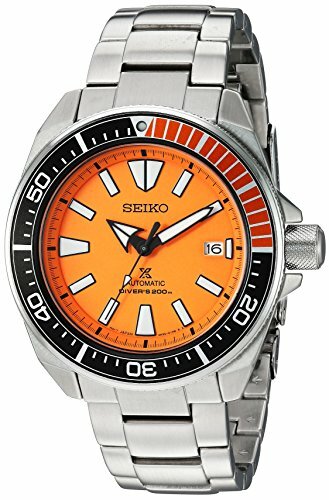 This Seiko Automatic watch is a mechanical watch with a self-winding mechanism. The self-winding mechanism winds the mainspring with the movement of the wearer’s wrist. The energy to drive the watch is stored within the mainspring and this watch does not require a battery. All Seiko Automatic watches have an overwind protection mechanism to prevent damage to the mainspring once it is fully wound. 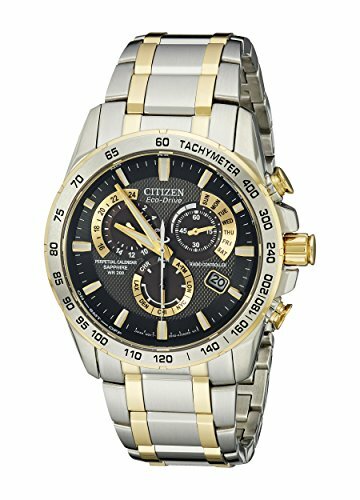 Citizen Eco-Drive with atomic timekeeping, the Perpetual Chrono A-T. Atomic clock synchronization for superior accuracy in 5 time zones, this perpetual calendar chronograph with alarm also features an anti-reflective sapphire crystal and brown ion plated bezel. Manually setting time: 1. Pull the crown out to position 2. 2. Press and release the lower right button (A). The second-hand moves to the 0-second position. 3. Rotate the crown to adjust the hour and minute. • You can correct the time in 1-minute steps. 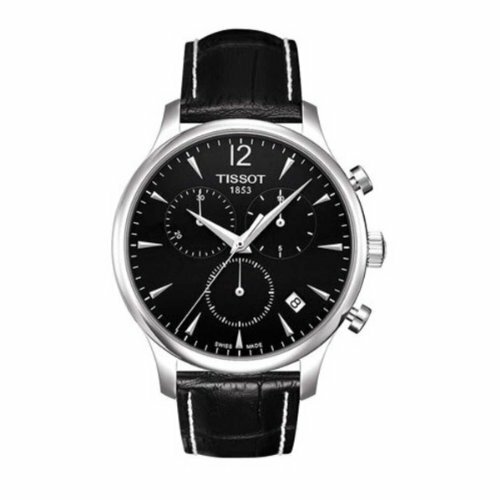 • The 24-hour hand (10:00 subdial) moves in conjunction with the hour hand. Be sure to pay attention to the 24-hour hand to set the proper AM or PM time. 4. Press and release the lower right button (A). The function hand (2:00 subdial) moves slightly. 5. Rotate the crown to adjust the date. • Every five turns of the function hand advance the date by one day. 0 1 2 Function hand Second-hand Button (A) 6. Press and release the lower right button (A). The second-hand points to the current month and year. 7. Rotate the crown to adjust the month and leap year. • To correct the month and leap year, make sure to rotate the crown clockwise. You cannot change them in the reverse direction. 8. Press and release the lower right button (A). The function hand (2:00 subdial) moves slightly. 9. Rotate the crown to adjust the day of the week. 10. Return the crown to position 0 to finish the setting. The current time and date are indicated. Citizen introduces its latest Eco-Drive timepiece, the Perpetual Chrono A-T, which is synchronized to the Atomic Clock and boasts the most accurate time-telling technology in the world, along with a sleek, masculine design.